I love quilting and I love writing which is why I started blogging in the first place. CHQuilts actually grew out of another blog, CHMusings, which is, as the name implies, all about the things I ponder, what matters to me, and all that I love in my daily life. No question, CHMusings is personal. It is for that reason that quilting was often times a topic. 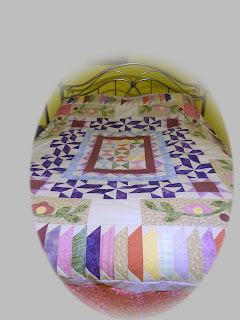 When it dawned on me that I was writing about quilting quite often, I decided to start CHQuilts. 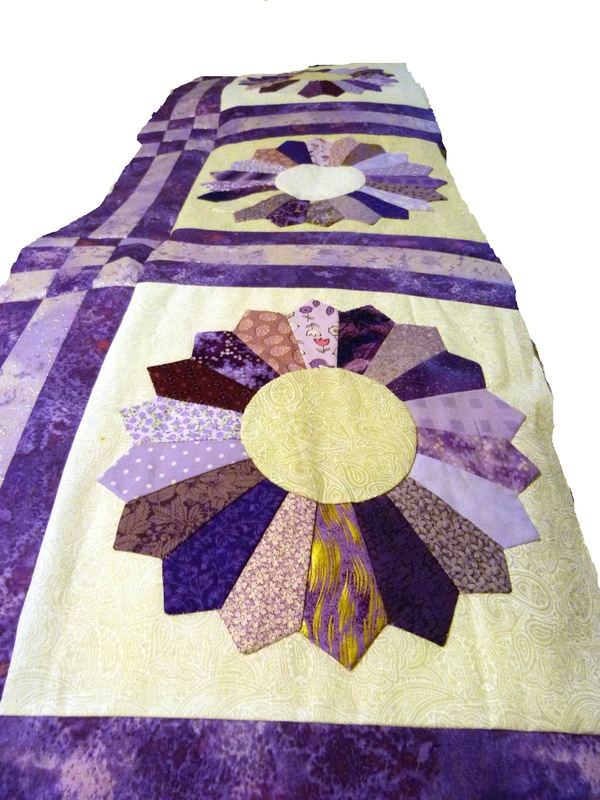 Funny, one of the most read posts in CHMusings, is about quilting, entitled, “New way to mark the quilt.” Feel free to check it out by clicking the link. Marking the quilt has always been a sore spot with me. One day I decided to try a new technique I'd heard about using Glad Press & Seal. Most of the posts I write come from my own experience. I try to write about as many teaching moments, or should I say learning moments. I'm learning new things all the time, as a former city girl who lives in the woods after moving to the Arkansas Ozarks. I do believe I have found my niche here. For the record, I also write two other blogs, CHBlog, which has a political bent and CHontrack, which showcases my interest in NASCAR, have lost some appeal for me lately. I’m sorry to say, they have been a bit neglected lately. I still write in them from time-to-time, but honestly, I’d prefer to spend my days quilting. I’ve found that the more I learn about quilting, the more I want to learn. There are always new questions, new techniques, and new ideas. There will always be a new quilt inside my head. I’m not a professional blogger by any means, I just write about things that interest me, but the one post about marking the quilt seemingly has sparked some interest. I love it when folks make comments. 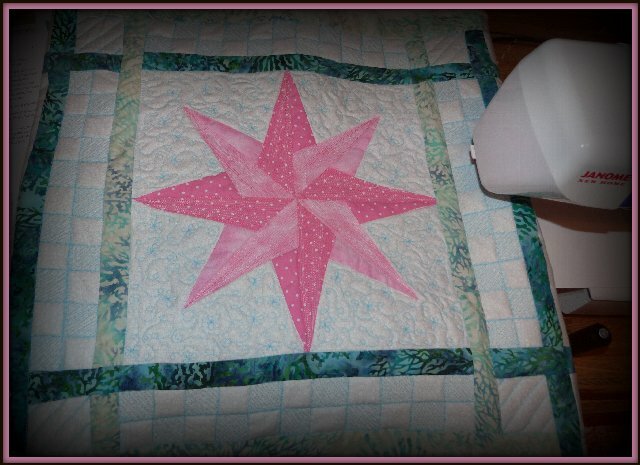 I love the conversational aspect of quilting and blogging. And I love the constant flow of information. It comes in so many forms. Quilters are generally curious and caring. Quilters love to share, and learn from one another. Quilters are a complete inspiration to me. There are so many aspects to quilting that I love, but meeting other quilters certainly ranks high on that list. So thank you to everyone who reads these posts; thank you to everyone that can relate in any way to quilting, and of course, those who comment on this and all other platforms from Facebook to the Quiltingboard to Craftsy pages, etc. I love the conversations. I love learning from you all, for you make me a better quilter. I tried spray basting a quilt for the first time. Whoa, there has to be a better way. Or, I’m just not doing it right. This exercise reminds me that when I said I loved every aspect of quilting, I lied. It isn’t a lie really, I’m just in denial about this part of the quilt making process. I have never been fond of this fundamental step-- putting a quilt top together with its batting and backing fabric—before the real fun begins. It is a very important step however. I’ve tried several different ways and haven’t found one that doesn’t make me grit my teeth. I’ve used the traditional safety pin method, where I generally get aggravated or impatient or both, causing me to start skimping on the number of pins I use. I’ve tried Sharon Shamber’s method of rolling the quilt onto boards and then basting the three parts together a little at a time. She makes it look so easy. This is probably one of the best methods I’ve seen, but it remains timely and cumbersome with a large quilt in a small space, which is what I have to work with. This is why I wanted to try the spray basting method. I used 505 adhesive spray. The only positive thing I can say about this step in the quilt making process, is that it is necessary. Without it, there is no process; There is no quilt. For me, that is just not an option. So, I will continue to grit my teeth. While I recognize that perfecting this technique would be well worth it, this was just my first time spray basting. I do see the benefits. Admittedly, I struggled with getting all the layers smooth. I disliked all the on-the-floor, off-the-floor, on-the-floor that was necessary. 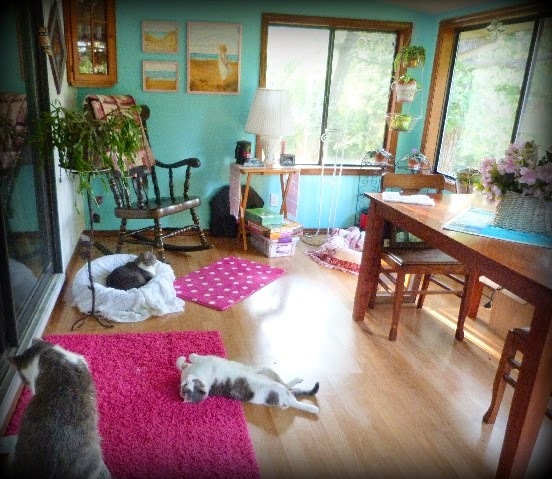 I think hanging the quilt would make it much easier than rearranging all the living room furniture, shooing the cats away, and hoping I didn’t glue all my belongings together, not to mention the bending, stooping, and walking in circles. My only hope is to try Patsy Thompson’s method, which involves hanging the quilt and letting gravity help keep things straight. I will try that next time. This is also the first time I used an oversized backing fabric. I had picked out a fabric that I already had, but didn’t really like it. I decided to purchase a nice piece of lavender print that was 104” wide. I bought four yards of it. I have been looking at this quilt for some time, actually. It was started ages ago. As outlined in a prior blog post, initially I wasn’t happy with it. It was square, so I enlarged it, adding an entire row with four brand new blocks, all the sashing and cornerstones. I was amazed how well that worked. If you didn’t know, you wouldn’t know. Then I decided I wanted to add the final border. I love how that turned out. It makes the quilt about the right size and in my mind, sets off the pattern nicely. But working with all that fabric was a headache. First I got out my iron and ironing board. Yikes! By the time I pressed the last of it, the first part was already wrinkled. I just looked at it for a few days, wondering what to do next. I laid out the back, unrolled the queen sized batting on top, then added the quilt top. There was lots leftover. I trimmed away some of it, which helped a little. The table I was working on was always adequate in the past. I’m not sure why it was such a struggle this time, but it certainly was. Finally, I folded the would-be quilt, with all three pieces and left them for a while. I had to figure out what, where, and how to get this thing basted. Finally I decided Friday night was it. Tired of looking at this pile of pretty purple fabric, I want to start quilting again. I decided the living room was it. I vacuumed. I moved all the furniture. I used painter’s tape to secure the corners and the middle of the backing fabric. Of course the tape didn’t stick to my vinyl flooring. I did the best I could though and spray basted one half at a time, first the top to the batting, then the batting to the backing. Then the other half. I did the best I could. Finally, I was able to slide a quilting hoop into the middle and secured it into place. Just the look of a quilt ready to be quilted is comforting to me. I placed the quilt hoop onto a wooden snack tray. The quilt drapes onto the floor, but should stay in relatively good form. Ryan, my cat loves new quilts, so I placed a towel on it to protect it from cat hair. Ryan is now its guardian. I’ve decided to hand-quilt this quilt. I think the traditional pattern deserves traditional quilting. I’ve already taken a few stitches. Oh my, this is not comfortable. I am very rusty. I will need lots of practice, but that will come. I started by drawing a spiral into the middle of one of the Dresden plates. Wow, this is harder than I remembered. So much for quilting being a relaxing activity. Right now, I’m tense, the lighting is terrible where I’m working, my stitches are not uniform, and I definitely need to find my rhythm. That will come. Now, I’m ready for those cold, winter nights. Bring it on! I have finally finished a project that wraps up my recent Craftsy Class--Quick Strip Paper Piecing. I've really enjoyed this class, taught by Peggy Martin. This project is a pillow using Martin's New York Beauty Block. 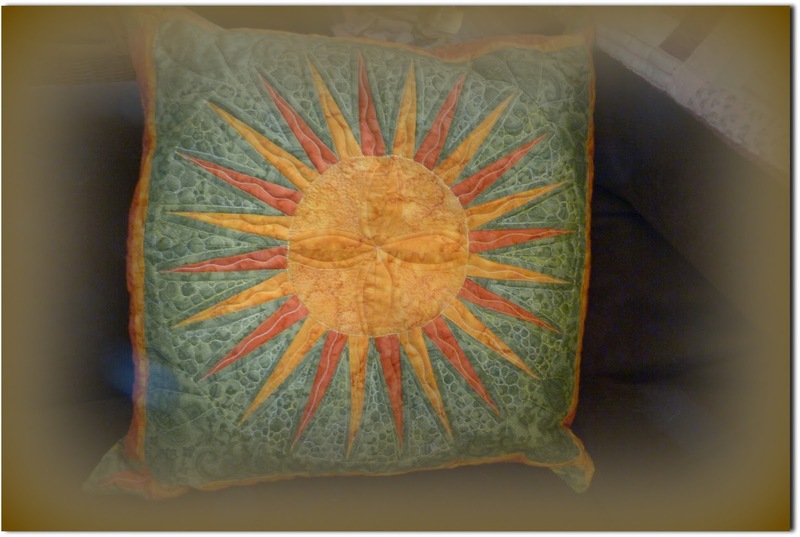 This is the completed pillow, both from the front and the back. It is pretty heavily quilted, and I enjoyed every minute of it. I really wanted to make a pillow. I had an old pillow--a very old pillow in fact--that I wanted to transform from a hugging pillow to a decorative pillow. For years, I have had this really comfy feather pillow. I've washed it, vacuumed it, hugged it, and more often than not, thrown it around in my sleep,...The poor thing was once a king-sized pillow, but due to its age, and feather loss, it was reduced to half its size. One day when I was making the bed, I decided to fold the pillow case in half around my favorite pillow. What used to require a large king-sized pillow case was now reduced to half of a standard one. And they say people shrink when they get older! That got me thinking. As much as I loved hugging this pillow, it was time to re-purpose it into something pretty. When I saw Peggy Martin's New York Beauty pattern, I knew this was my answer. The bedroom is decorated with sunflowers. I just love the yellow and orange tones of these smiley-faced flowers. I also love the sun shapes, such as those seen on CBS Sunday morning. I'm so drawn by those pleasant shapes that make up the beautiful star that shines on us and sustains us each and every day. It took a little while because I don't have the time to quilt as much as I'd like these days, but I finally finished my pillow. I can't imagine making a whole quilt in this pattern, because I just don't have the time. But I know that if I did, it would be a real spectacle. I love the pattern. I love Martin's technique. And I love my new pillow. Quilting is not just a challenge for me; it is also a respite that is vitally important to my well-being. I'm anxious to return to it when time permits. I've been 'away' from blogging, and from quilting for awhile, since just days before Thanksgiving, when my husband John, who has been slowly recovering from a stroke a year ago, passed out and fell backwards, hitting his head hard on the floor. We suspect he was suffering from low blood pressure. He was unconscious for a short time and remembers none of it, which is probably a blessing. I called 911 and followed the paramedics to the hospital. Tests revealed that he had a brain bleed, which is being considered another stroke, so they decided to transport him via helicopter to another hospital, in a neighboring state, where there was an available neurosurgeon standing by if necessary. The hospital was more than two hours away. I went the next morning and stayed one night with him, but had things to tend to at home. We stayed in close contact. Sadly, all of the progress John had made in the last year was gone, and even exacerbated with this latest incident. His had no mobility on his entire right side. John stayed in the hospital for a few days and was transferred to a rehabilitation center for in-hospital rehab. He's home now and receives at home therapy three times per week as he struggles to regain his mobility in his hand, arm, leg, and foot. I've resumed my caretaker responsibilities which doesn't leave much idle time. I've taken to reading, while he takes an afternoon nap, since it isn't long enough to get "into" a quilting project. Quilting isn't far from my mind though, as I do steal away some moments when I can, to watch quilting videos and ponder current and future projects. Between visits, while John was in the hospital, I spent an entire day satisfying my own mental health needs, as I worked on a project from the Craftsy class I mentioned previously, Quick strip paper piecing with Peggy Martin. I love how this Christmas table topper turned out. It is about 22" square. It is from Peggy Martin's 'Sailor's Delight' pattern. It just screamed Christmas to me. I wanted to do more of these, perhaps make Christmas gifts, but we didn't get around to celebrating this year. This piece was great fun though and was so much easier than it looks. I've decided I may not be finished with this pattern yet. I'm not going to store my Christmas fabrics just yet, just in case I get some free time. The latest tool in my quilting arsenal is foundation paper piecing. I'm taking a Craftsy class by Peggy Martin using her technique which really does streamline the paper piecing process. I've dabbled in paper piecing in the past and wasn't completely enamored with it. I do like the results though. Who doesn't want sharp angles and points that aren't cut off? Peggy's Quick Strip Paper Piecing method eliminates one of my biggest problems--working with triangles of fabric. I've listened to the entire class, which began months ago. I'm going over it a second time now, and actually making the blocks. There are several blocks in the various lessons in the class. They may or may not end up as entire quilts--but I want to at least try making them. They seem to get more complex as we go through the lessons. I'm anxious to do more, now that I've gotten my feet wet. So far I made a table runner, out of Peggy's Dreamweaver quilt block, which consisted of three blocks and a woven sashing, which she also demonstrated. It was fun to do and much easier than traditional paper piecing as I had learned it. Initially I thought this star would make a great Christmas star with red and green points. But, then I decided I'd really like to have a table runner to match my most recent quilt--my pink flamingo quilt, which is draped across the back of the couch in our Florida room. I had just enough turquoise batiks left to make sashing strips. Once I finished the three-block piece, I couldn't wait to start quilting it. This is a work in progress, but I'm pleased with it so far. First I printed out a sketch of the three-block piece. I let the quilt "talk to me" so I could decide what kind of quilting patterns I wanted to use. This is the result. I'm glad I decided to use two different colors of thread. The first is a pink variegated that I had from another project. Of course the teal color is from all those pink flamingos. One of the three blocks is complete. Forgive the blue lines on the checkerboard design. I haven't washed them out yet. By the way, I absolutely love checkerboards in quilts--they just seem to go together. This is what the back looks like. 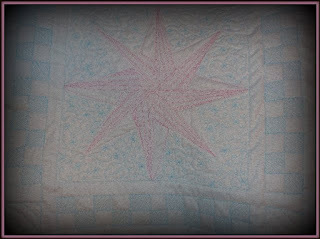 It reveals the dense quilting in the star that isn't very visible on the front. All these colors in a project really is a new thing for me. I'm enjoying this expansion beyond the boundaries of my former monochromatic comfort zone. I really love color and the older I get, the bolder I want it to be. I'm anxious to finish this project and see what it looks like on the table. Have I mentioned lately that I absolutely love quilting? I've finally finished my Halloween project--three table runners for my daughter. This is the third and final one. I think I like this one the best. There is no denying, this is for Halloween! I rather like scrappy string quilt blocks. They are so versatile, easy and fun to do, and the results can be stunning. While this pattern is just fine the way it is, serving the purpose of resembling spider webs, it is also quite dramatic when these blocks are duplicated into an entire quilt. For quilt makers, you already are aware of the kind of magic that happens when individual blocks come together to form another shape. But for those who aren't quilters, check out the photo to the right. These same blocks are just copied and pasted into a three-by-three grid to reveal just what happens when the blocks are put together. Note the four-pointed stars that seemingly appear between the spider web blocks. Quilting is just so much fun! If the orange sashing were removed, the stars would likely be even more apparent. So try to imagine a quilt, using different colored strips on a white background. Or on a colored background with contrasting strips. I may one day decide to make one of these, since I seem to be accumulating leftover pink and purple strips from other projects. 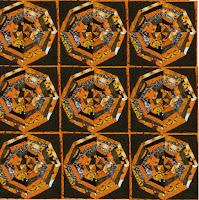 These blocks were constructed using foundation paper piecing. Varying strips of fabric are sewn onto pieces of (foundation) paper, in two different wedge designs. There are four of them for each block. The eight wedges are then sewn together to form the block. The paper is then removed. Because sewing is done on the printed line of the pattern, foundation piecing aids in creating sharp points and well aligned seams. In this 'scrappy' project, the seams were meant to be askew, so that wasn't important. The only place the points mattered was in the middle where all eight seams came together. That is almost always a problem. On one of these blocks, I sewed the pieces together with the paper still attached. Never having done that before, it was a disaster. The points didn't come close to matching in the center. So, once I removed all the (foundation) paper backing, which is sometimes more time consuming that crafting the entire block, I took all the seams apart. I had real second thoughts about that because what I was left with was a giant gaping hole in the center. The more I messed with it, the more the fabric began to fray. I was thinking there wouldn't be enough fabric left to make it work. I assumed I'd have to just toss that block and make another one. Much to my surprise though, I was able to sew all the seams together again. The points looked pretty good. I like to call that a quilting success. It doesn't happen often in cases like that, but I was pleased with how it turned out. This was an easy block to construct. There are a variety of ways to do this, but I used a pattern I found online. There are oodles of them. I just hope Jenny likes it. Now, off to the post office. Even cats know what they like and what they don't! While I absolutely love every quilting project I've ever made; this one, not so much. I just finished the second of three Halloween table runners for my daughter, Jenny. She requested a dark one, scary with all black fabrics. Even Junior the cat turned away from it--not a good sign at all. Thankfully, it is just for Halloween and not something to be used every day. There are elements of this that I really like. I like the pattern--the bow-tie block--but there should have been more contrast. It is hard to distinguish that those are bow ties. And, the quilting isn't bad--but using black thread on black fabric; certainly doesn't showcase the quilting. The bow ties are quilted with lightening bolts radiating from the center, though it is hard to see. There are even lightening bolts in the fill design in the space outside the bows, but who can see them? The center four squares are quilted in a spider web design, but again, it doesn't show. I was hoping that washing the piece would make the quilting stand out, but it really didn't. At least there is the spiderweb border that glows-in-the-dark. That will be really cool. I've already alerted Jenny to this situation, and sent her a photo. She isn't crazy about this one either, but I suppose we should just chalk this up to, 'it's only for Halloween,' and move on to the third and final project. I've already started on it and I know we'll like it so much more. When I set out to make a table runner, I looked for a pattern that would showcase a center patch. (That's funny, since the center is the part I dislike the most about this piece). When I saw the bow ties, I was drawn to it. I went to my Electric Quilt software to draft the block and estimate needed yardage. I also printed out the templates for the bow tie pattern. It never even occurred to me that there was an easier way. Then, I didn't realize until I had all the fabric for the whole project cut out that I needed to make the dreaded "Y-seams" for this method. It isn't that I've never done them; it is just that I don't like doing them. In this video, one of my favorite quilters, Jinny Beyer, explains how to create a perfect Y-seam by both machine and by hand. With four bow ties, each with 2 Y-seams, that translates into 8 per block and 24 in the three blocks. I actually thought about sewing all these by hand, since it is so much easier, but in the name of time, I decided not to. They turned out fine, however. Once I had all of them completed, I realized what an inexperienced quilter I am. I found an online tutorial for a bow-tie block making this as simple as making a four-patch. I have been quilting for how long now? It is alarming that I couldn't figure out this simple method. I'm over it now, and it was good to practice making Y-seams, but I was really mad at myself at first. Check out Jenny Doan of Missouri Star Quilt Co. as she makes a quilt out of the bow-tie block. I've always said, there is no end to learning in quilting. So, after more than fifteen years, I guess I'm still a newbie. I've had to take a little step back from my quilt progress. I have had a request from my daughter, Jenny, to make three Halloween table runners for her. "I don't want anything cutesy," she said. "I want it to be scary." She even wanted fabric with blood stains printed on it, but that is where I drew the line. "No way," I told her. I remember having a similar discussion with her many years ago. She came home from school, about fifth grade, with fake blood someone had given her. She wanted me to put it on her face. I was horrified. I told her that her beautiful face and blood, fake or otherwise, would never go together in my world. In my job as a local reporter, I've seen more blood--real blood--than anyone needs to. I was certainly not going to allow her to simulate what is so often a sad or even tragic event. I never really liked Halloween because people seem to have taken it too far for my taste. To me, fantasies include Cinderella, Snow White, Elsa and Anna; not zombies and walking dead. That stuff just creeps me out. Anyway, I told her it didn't matter because despite the fabric, these table runners will be beautiful. Quilted pieces are always beautiful, never scary. I was happy when we agreed on a little glow-in-the-dark fabric instead. Actually, this is a great step forward because until now Jenny hasn't shared my love of quilting. She has proclaimed her preference of crocheted afghans to quilts. I think she's coming around though, recognizing the amount of time and effort that goes into quilt making. She is also finding her own crafty legs, as she is starting to appreciate the beauty of being making something. I knew the creative gene was lurking in her somewhere and that it was just a matter of time. In fact, the older she gets, the more we have come to appreciate each other's abilities, personalities, and quirks. Sadly, we live miles apart with her in Massachusetts and me in Arkansas. I've noticed though that miles really don't matter as long as we can reach out through all the means of communication afforded us these days. Even though I know she is miles away, she is just a phone call away. That is comforting. Anyway, I finished the first project. Here they are, front and back. The glow-in-the-dark fabric is the frame around the center square and each of the small squares that form a line along the middle. The best part is that she says she likes it and can't wait to see the next one; music to my ears. Actually, I can't wait either, since I have only a slight notion about what I'm going to make for the other two. Ah, the creative process. I know something good will come out of my sewing space. I just don't know what right now. But soon! I'd say a finished quilt top can be considered an accomplishment, especially when it was a bunch of pieces just laying around for so long. I started this so long ago. Once I got back to it, I realized how much of it had been done already. I think there were only four more Dresden Plate blocks to finish, and of course the sashing. The sashing with its 25 9-patches and alternating strip sets was pretty epic considering I had never done such a thing before. Lots of pinning was necessary. I had it in my head though, that this was how I wanted to connect the blocks in Orchid Flowers. I will attach the borders after they are quilted, probably via the skinny, unquilted white border in the quilt-as-you-go method. Though it doesn't show in this photograph, each alternating block is white and off-white--both in a paisley print. (I absolutely adore paisley.) Perhaps I should make the joining strips alternating as well, although I'm not sure the design element would be worth the extra effort. I'm taking another break from Orchid Flowers. My daughter is interested in some Halloween table runners, so that will take precedent. As long as I'm quilting, it's all good! It might be impossible to expect all aspects of our lives to be positive, successful, or even worth talking about. But, I have to say, quilting is one of those facets in my life that is worth it. For me, quilting is good medicine. When life's challenges get to you, nothing says 'hang-in-there' better than some quality alone time working with a needle and thread. Whether it be by hand or by machine, quilting is such good therapy. Since my husband's illness, I have been turning to my favorite pastime as much as I'm able. It really helps. Quilting has a calming quality about it that makes coping just a little easier. It has the added effect of satisfying that creative spark. It is so nice to just be able to make something pretty. Let's face it, quilts are pretty. Rarely, if ever, have I seen an ugly quilt. My quilt life is getting exciting once again, as I now have two projects to work on, at least so far. I once belonged to the get'r done camp, thinking that I had to finish one before I could start on another. But with quilts taking sometimes more than a year to finish, I gave myself permission to work on more than one at a time. Orchid Flowers is coming along. In fact, I have all the Dresden Plate blocks finished and have started on the sashing. Who knew that the sashing would be as much or more work than the Dresdens, which are the focal point? I sure didn't, until I started sewing and cutting and sewing some more, all those strips. I have sashing on all the blocks. I just finished the 9-patches and sashing for the first row. I was worried that the sashing would overtake the Dresdens, since it is 2" wide and the Dresden strips are about 1.4" wide. But, it like the look. I'm anxious to finish the entire quilt top. I have no idea what kind of backing to use. 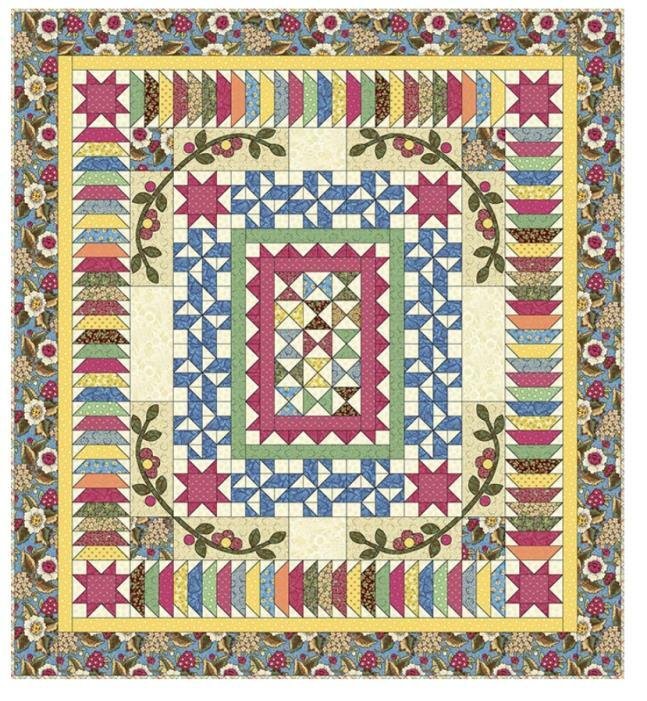 I've decided that I am going to quilt this on the machine, which will be a first for me--quilting a whole quilt top--rather than just a block at a time. I'm looking forward to this challenge. There is still lots left to do before any more decisions are made. I have cut all the pieces for the sashing and cornerstones, I think. I'm not that great at math, so it will be fun to see if I came anywhere close to how many strips I'll actually need. No matter--I have more fabric if I need it. Aren't those colors just delicious? I started this quilt a very long time ago. I was surprised when I came back to it, that I cut the initial blocks 12". I did it before I realized there should be a seam allowance added to the block. So, the blocks will finish at 11 1/2" No big deal. I will make up for it with the wider sashing and eventual borders around the entire quilt. I have a very dark violet color for the outside border. The outside border fabric for Orchid Flowers is a Jinny Beyer fabric. I have long been a fan of hers, since the early days of my watching Simply Quilts, which I mentioned in a previous post. 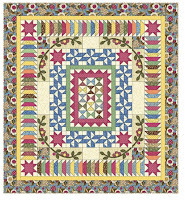 I also mentioned that I was considering ordering Jinny's Block of the Month Club quilt kit from Craftsy. She is teaching a class detailing so many of her techniques. I bit the bullet. I decided to order the quilt kit. I have never ordered a kit before. It was a bit pricey, but was on sale since the class started months ago. I'm glad I waited. The kit arrived yesterday. I haven't even taken it out of the bag yet, although I did stick my hand inside, so I could pet the luscious fabrics. Jinny's taste in colors and fabrics she designs are just magnificent. I love her border prints, which really is what sold me on this class and this kit. I don't plan to open it until I am ready to begin the project. Until then, I just plan to ogle it. As I continue along my quilting journey, I decided to take a trip back to my roots. I finally signed up for a star membership in The Quilt Show, which is not unlike an online television show. I have no idea what has taken me so long to jump into this. The Quilt Show, hosted by Alex Anderson and Ricky Tims will keep me on my learning quest. It isn't that I needed more to learn because every time I pick up a needle I'm learning something new. I already have the motivation and inspiration. I could use a little more time to practice, but that will come. For now, I'm still enjoying the seemingly endless quest for quilting knowledge. I spent yesterday watching a few of the past shows, with access to all the teachers and techniques that have been on the show since 2007. I may go through the episodes one at a time eventually, but for now, I'm just picking and choosing. 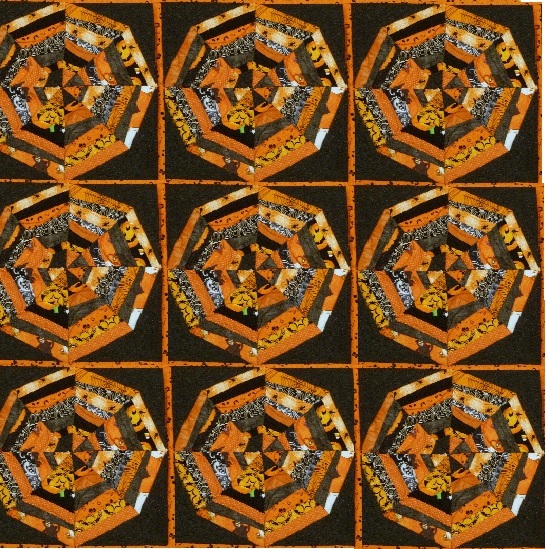 Alex Anderson provided some of my earliest inspirations for quilting. Not only did she host "Simply Quilts," a wonderful quilting show, but she was an excellent quilter in her own right. I used to watch religiously. If I knew I was going to miss it, I recorded it. Like so many others, when I learned it was going off the air, I was crushed. I learned so much from that show. Most importantly, I learned that I really wanted to make a quilt. I wasn't a quilter when I first started watching. When I finally did get around to making my first quilt, I had no idea what I was doing. I tried to follow the steps laid out in my head from all I had observed for years. Finally, one day my daughter and I went to Joanne Fabrics in Orland Park, IL to pick out fabric. I hoped I was getting the right amount. I was exhilarating, but frightening to look at that pile of folded fabric. I realized right then that I loved having all those yards, half-yards, and quarter-yards in my hands. Nothing was as terrified as cutting into that beautiful bleached muslin the first time. The picture is just the quilt top. I did finish the quilt. Never having done applique before, I made some mistakes, but when looking at the overall pattern, I can cut myself some slack. I never did needle-turn applique before. I figured back then that I can only get better. I picked out a simple rosette to hand-quilt into the empty spaces and outline quilted the elements of the Rose of Sharon blocks. It isn't the best-looking quilt ever, but it made me very happy to complete it. I'm not sure when I finished this quilt. Judging from the photo though, this had to be taken sometime between 2003 and 2005. I notice a Delft blue container on the dresser that was from an arrangement I bought for my father's funeral in June, 2003. We moved out of that house in Jan. 2005. I completed that quilt in 2004 because it was done before we moved. I guess the moral of this story is to always make a label for our completed quilts. I still put this quilt on the bed now and then. But mostly, it rests in good company, sitting on a quilt rack with the quilt my husband's mother made him when he graduated from eighth grade and one his late grandmother cross-stitched and quilted that she used on her bed. With my husband's illness--he had a stroke in January--both of us have had some re-adjusting to do. He spends his time trying to get back to the way he used to be. I spend my time trying to keep things running along smoothly in our lives. Both are challenging. I find myself doing things I never did before, and some of them are admittedly, not to my liking. But, I temper that with stealing away moments here and there to head back to my sewing machine. I have long recognize the 'all work and no play,...' scenario. Quilting is my play. 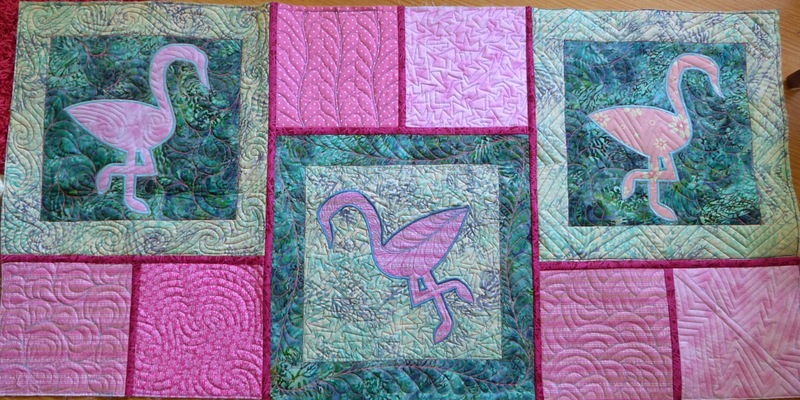 I find myself squirreling away a few spare moments when I can just to get some work done on my latest project; the above pink flamingo quilt, which I modified a little from the butterfly quilt-along designed by Leah Day. I committed to it ages ago, but only just recently started working on it. As John gets more independent, and he is doing more things on his own these days, I'm slowly getting back to having a little more time for quilting. I'm taking it too, even if it means letting the dirty dishes sit for a little longer or starting supper a little later. I need the time because a little stitch here and a little stitch there just doesn't cut it. One thing I have noticed is that without dedicating some good practice time, quality may suffer. Free-motion quilting isn't like riding a bike. It is not a once you learn it you know it proposition. Free-motion quilting requires practice, and lots of it. I can't wait to comply with my own edict--to spend more time quilting. After all, it is fun to quilt. Truthfully, I can't wait to see this one completed. A finished quilt is the best thing ever. And by finished I don't mean simply done and bound. I mean thrown into the washing machine where the big moment of truth occurs. Will the colors run; will the stitches hold? Even when a few seams need to be re-sewn after washing, it is worth it because the texture of the quilt gets what I call "quilty." The fabric shrinks ever so slightly, puffing up around the stitches. The result is like magic. I can't wait to see this quilt finished. But until that time, I'm going to keep squirreling away time to work on it. I've said it before and it bears repeating--I love every aspect of the process of quiltmaking. From the decisions on colors, patterns, down to the precision cutting, sewing, and finally the quilting, it is all great fun and great therapy. Stability is such a fleeting thing. Just when you think things are going along swimmingly, something happens to alter your course. Mine was altered when my husband became ill. I've had to switch gears a little, going from quilter to caretaker. John had a stroke in mid-January, so all my energy of late, has been devoted to tending to him and his needs. 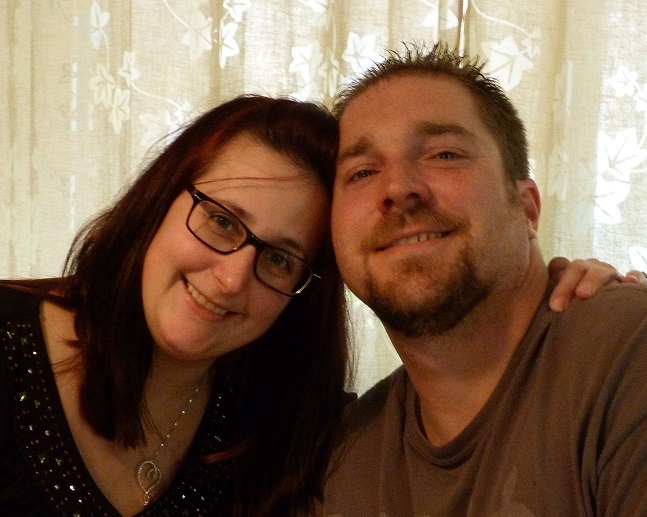 In addition, I've been doing all the cooking, cleaning, chores and errands, many of which he used to handle. For a while, it was overwhelming, but I must be getting more efficient, since I've found a little time to get back to my sewing machine. He is doing much better, but will have a long road yet to travel. 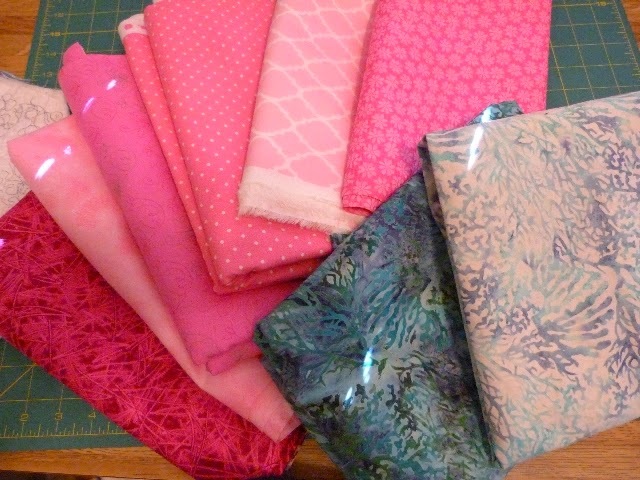 I hadn't started on my Pink Flamingo quilt, the (Dancing Butterflies) quilt-as-you-go project with Leah Day, but I have done lots of thinking about it. All the planning in my head made it easier to dive in when I found a little spare time. It felt good to get back to my project, which at this point was a pile of fabric. First, all the cutting. 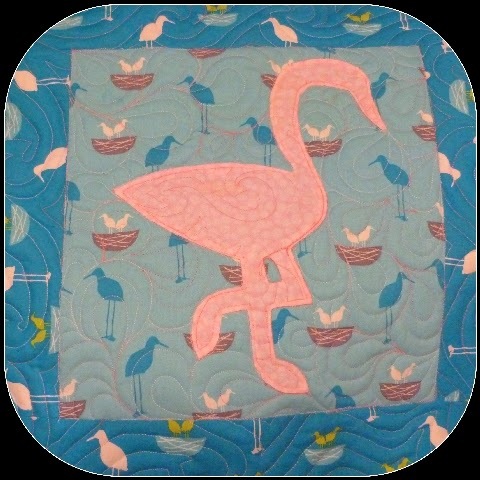 It was easier than I thought to cut out all those flamingos, as well as the background squares onto which they would be appliqued. I've never used fusible web before, but that was in the pattern, so I carefully read the directions. I think I love it. It was easy to applique all the birds in place where I wanted them. I decided not to have them all facing the same way or to have all of them standing upright on each block. I see lots more applique projects in my future! I wasn't so sure I liked the idea of satin stitching all those shapes onto the background fabric either. But it really wasn't so bad. In fact, I think I like it. Letting the machine do the work is so much easier and turns out so much better than my attempts at needle-turn applique. Speaking of stability...That reminds me of the tear-away stabilizer I was to use to secure my flamingos onto the background fabric. The stabilizer keeps the dense stitches from distorting the fabric. I have a little tip. I have no idea if this is a common practice when using tear-away stabilizer, but I quite accidentally came across it. When I did the first few blocks, I cut a huge square of stabilizer, the size of the motif and stuck it to the back of the block. It worked well, in that the stitching was uniform and without puckers or bubbles. But, when I went to tear it off, it was very difficult. Still, I muddled through for 4 of the blocks, cussing and tearing, tearing and cussing. On the fifth one, it occurred to me that each square contained a large amount of unused stabilizer. I was worried that the roll I was using wouldn't be enough to finish the 12 blocks I had to do. So, in my frugal way, I decided to improvise. When I put the square of stabilizer onto the back of the block, I held it up to the light and trimmed away that which was not near where I was going to stitch. On the sixth block, I pieced those remnants together, completely covering the area that needed stitching. It worked. In fact, it worked well because it was easier to tear it off. So now, I have decided to just cut strips and place them where needed. I wish I would have done that in the first place. It is so much easier. Once the piece is stitched, it is no problem to tear away these few pieces. This is one of the things I just love about quilting. There are always new things to learn, new techniques to try, and new ways to do things that make the process all the more enjoyable.